I really love this: a relativistic aether. My interpretation of the wavefunction is very consistent with that. Note: I have published a paper that is very coherent and fully explains what the fine-structure constant actually is. There is nothing magical about it. It’s not some God-given number. It’s a scaling constant – and then some more. But not God-given. Check it out: The Meaning of the Fine-Structure Constant. No ambiguity. No hocus-pocus. Well… I was disappointed. Despite the impressive credentials of its author – a retired physics professor – it was very poorly written. It made me realize how much badly written stuff is around, and I am glad I am no longer wasting my time on it. However, I do owe my brother some explanation of (a) why I think it was bad, and of (b) what, in my humble opinion, he should be wasting his time on. 🙂 So what it is all about? 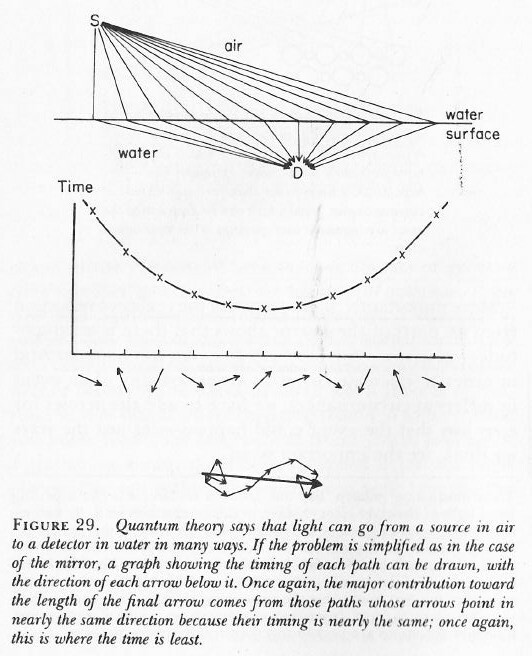 The article talks about physicists deriving the speed of light from “the electromagnetic properties of the quantum vacuum.” Now, it’s the term ‘quantum‘, in ‘quantum vacuum’, that made me read the article. Indeed, deriving the theoretical speed of light in empty space from the properties of the classical vacuum – aka empty space – is a piece of cake: it was done by Maxwell himself as he was figuring out his equations back in the 1850s (see my post on Maxwell’s equations and the speed of light). And then he compared it to the measured value, and he saw it was right on the mark. Therefore, saying that the speed of light is a property of the vacuum, or of empty space, is like a tautology: we may just as well put it the other way around, and say that it’s the speed of light that defines the (properties of the) vacuum! Indeed, as I’ll explain in a moment: the speed of light determines both the electric as well as the magnetic constants μ0 and ε0, which are the (magnetic) permeability and the (electric) permittivity of the vacuum respectively. Both constants depend on the units we are working with (i.e. the units for electric charge, for distance, for time and for force – or for inertia, if you want, because force is defined in terms of overcoming inertia), but so they are just proportionality coefficients in Maxwell’s equations. So once we decide what units to use in Maxwell’s equations, then μ0 and ε0 are just proportionality coefficients which we get from c. So they are not separate constants really – I mean, they are not separate from c – and all of the ‘properties’ of the vacuum, including these constants, are in Maxwell’s equations. In fact, when Maxwell compared the theoretical value of c with its presumed actual value, he didn’t compare c‘s theoretical value with the speed of light as measured by astronomers (like that 17th century Ole Roemer, to which our professor refers: he had a first go at it by suggesting some specific value for it based on his observations of the timing of the eclipses of one of Jupiter’s moons), but with c‘s value as calculated from the experimental values of μ0 and ε0! So he knew very well what he was looking at. In fact, to drive home the point, it may also be useful to note that the Michelson-Morley experiment – which accurately measured the speed of light – was done some thirty years later. So Maxwell had already left this world by then—very much in peace, because he had solved the mystery all 19th century physicists wanted to solve through his great unification: his set of equations covers it all, indeed: electricity, magnetism, light, and even relativity! I think the article my brother liked so much does a very lousy job in pointing all of that out, but that’s not why I wouldn’t recommend it. It got my attention because I wondered why one would try to derive the speed of light from the properties of the quantum vacuum. In fact, to be precise, I hoped the article would tell me what the quantum vacuum actually is. Indeed, as far as I know, there’s only one vacuum—one ’empty space’: empty is empty, isn’t it? 🙂 So I wondered: do we have a ‘quantum’ vacuum? And, if so, what is it, really? Now, that is where the article is really disappointing, I think. The professor drops a few names (like the Max Planck Institute, the University of Paris-Sud, etcetera), and then, promisingly, mentions ‘fleeting excitations of the quantum vacuum’ and ‘virtual pairs of particles’, but then he basically stops talking about quantum physics. Instead, he wanders off to share some philosophical thoughts on the fundamental physical constants. What makes it all worse is that even those thoughts on the ‘essential’ constants are quite off the mark. So… This post is just a ‘quick and dirty’ thing for my brother which, I hope, will be somewhat more thought-provoking than that article. More importantly, I hope that my thoughts will encourage him to try to grind through better stuff. 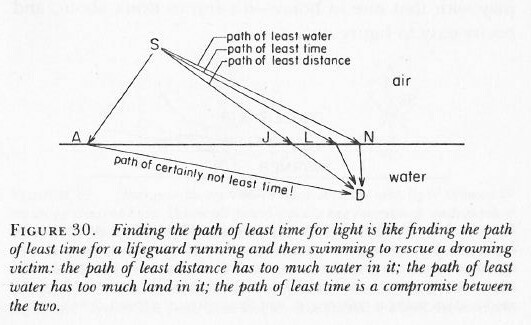 As I showed in my above-mentioned post, the speed of light (i.e. the speed with which an electromagnetic pulse or wave travels through space) is just one of the many consequences of the mathematical structure of Maxwell’s set of equations. As such, the speed of light is a direct consequence of the ‘condition’, or the properties, of the vacuum indeed, as Maxwell suggested when he wrote that “we can scarcely avoid the inference that light consists in the transverse undulations of the same medium which is the cause of electric and magnetic phenomena”. Of course, while Maxwell still suggests light needs some ‘medium’ here – so that’s a reference to the infamous aether theory – we now know that’s because he was a 19th century scientist, and so we’ve done away with the aether concept (because it’s a redundant hypothesis), and so now we also know there’s absolutely no reason whatsoever to try to “avoid the inference.” 🙂 It’s all OK, indeed: light is some kind of “transverse undulation” of… Well… Of what? This re-formulation, which is Feynman’s preferred formula for electromagnetic radiation, is interesting in a number of ways. It clearly shows that, while we analyze the electric and magnetic field as separate mathematical entities, they’re one and the same phenomenon really, as evidenced by the B = –er‘×E/c equation, which tells us the magnetic field from a single moving charge is always normal (i.e. perpendicular) to the electric field vector, and also that B‘s magnitude is 1/c times the magnitude of E, so |B| = B = |E|/c = E/c. In short, B is fully determined by E, or vice versa: if we have one of the two fields, we have the other, so they’re ‘one and the same thing’ really—not in a mathematical sense, but in a real sense. Now, after having praised Maxwell once more, I must say that Feynman’s equations above have another advantage. In Maxwell’s equations, we see two constants, the electric and magnetic constant (denoted by μ0 and ε0 respectively), and Maxwell’s equations imply that the product of the electric and magnetic constant is the reciprocal of c2: μ0·ε0 = 1/c2. So here we see ε0 and c only, so no μ0, so that makes it even more obvious that the magnetic and electric constant are related one to another through c.
μ0 is expressed in (V·s)/(A·m), while ε0 is expressed in (A·s)/(V·m), so the dimension in which the μ0·ε0 product is expressed is [(V·s)/(A·m)]·[(A·s)/(V·m)] = s2/m2, so that’s the dimension of 1/c2. Now, this dimensional analysis makes it clear that we can sort of distribute 1/c2 over the two constants. All it takes is re-defining the fundamental units we use to calculate stuff, i.e. the units for electric charge, for distance, for time and for force – or for inertia, as explained above. But so we could, if we wanted, equate both μ0 as well as ε0 with 1/c. Now, if we would then equate c with 1, we’d have μ0 = ε0 = c = 1. We’d have to define our units for electric charge, for distance, for time and for force accordingly, but it could be done, and then we could re-write Maxwell’s set of equations using these ‘natural’ units. In any case, we’re done with this. On to the next! The second thought I want to develop is about the mentioned quantum oscillation. What is it? Or what could it be? 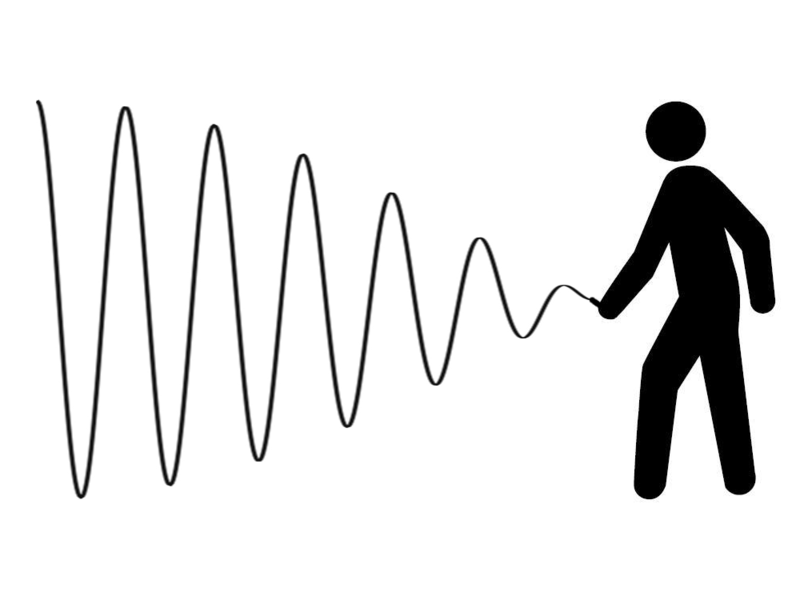 An electromagnetic wave is caused by a moving electric charge. What kind of movement? Whatever: the charge could move up or down, or it could just spin around some axis—whatever, really. For example, if it spins around some axis, it will have a magnetic moment and, hence, the field is essentially magnetic, but then, again, E and B are related and so it doesn’t really matter if the first cause is magnetic or electric: that’s just our way of looking at the world: in another reference frame, one that’s moving with the charges, the field would essential be electric. So the motion can be anything: linear, rotational, or non-linear in some irregular way. It doesn’t matter: any motion can always be analyzed as the sum of a number of ‘ideal’ motions. So let’s assume we have some elementary charge in space, and it moves and so it emits some electromagnetic radiation. So now we need to think about that oscillation. The key question is: how small can it be? Indeed, in one of my previous posts, I tried to explain some of the thinking behind the idea of the ‘Great Desert’, as physicists call it. The whole idea is based on our thinking about the limit: what is the smallest wavelength that still makes sense? So let’s pick up that conversation once again. The Great Desert lies between the 1032 and 1043 Hz scale. 1032 Hz corresponds to a photon energy of Eγ = h·f = (4×10−15 eV·s)·(1032 Hz) = 4×1017 eV = 400,000 tera-electronvolt (1 TeV = 1012 eV). I use the γ (gamma) subscript in my Eγ symbol for two reasons: (1) to make it clear that I am not talking the electric field E here but energy, and (2) to make it clear we are talking ultra-high-energy gamma-rays here. In fact, γ-rays of this frequency and energy are theoretical only. Ultra-high-energy gamma-rays are defined as rays with photon energies higher than 100 TeV, which is the upper limit for very-high-energy gamma-rays, which have been observed as part of the radiation emitted by so-called gamma-ray bursts (GRBs): flashes associated with extremely energetic explosions in distant galaxies. Wikipedia refers to them as the ‘brightest’ electromagnetic events know to occur in the Universe. These rays are not to be confused with cosmic rays, which consist of high-energy protons and atomic nuclei stripped of their electron shells. Cosmic rays aren’t rays really and, because they consist of particles with a considerable rest mass, their energy is even higher. The so-called Oh-My-God particle, for example, which is the most energetic particle ever detected, had an energy of 3×1020 eV, i.e. 300 million TeV. But it’s not a photon: its energy is largely kinetic energy, with the rest mass m0 counting for a lot in the m in the E = m·c2 formula. To be precise: the mentioned particle was thought to be an iron nucleus, and it packed the equivalent energy of a baseball traveling at 100 km/h! But let me refer you to another source for a good discussion on these high-energy particles, so I can get get back to the energy of electromagnetic radiation. When I talked about the Great Desert in that post, I did so using the Planck-Einstein relation (E = h·f), which embodies the idea of the photon being valid always and everywhere and, importantly, at every scale. I also discussed the Great Desert using real-life light being emitted by real-life atomic oscillators. Hence, I may have given the (wrong) impression that the idea of a photon as a ‘wave train’ is inextricably linked with these real-life atomic oscillators, i.e. to electrons going from one energy level to the next in some atom. Let’s explore these assumptions somewhat more. However, what we’re interested in is not the energy of the photon, but the energy of one cycle. In other words, we’re not thinking of the photon as some wave train here, but what we’re thinking about is the energy that’s packed into a space corresponding to one wavelength. What can we say about that? So the constant of proportionality is ε0c. [Note that, in light of what we wrote above, we can also write this as S = (1/μ0·c)·〈(c·B)2〉 = (c/μ0)·〈B2〉, so that underlines once again that we’re talking one electromagnetic phenomenon only really.] So that’s a nice and rather intuitive result in light of all of the other formulas we’ve been jotting down. However, it is a ‘wave’ perspective. The ‘photon’ perspective assumes that, somehow, the amplitude is given and, therefore, the Planck-Einstein relation only captures the frequency variable: Eγ = h·f. Energy is measured in electronvolt or, using SI units, joule: 1 eV ≈ 1.6×10−19 J. Energy is force times distance: 1 joule = 1 newton·meter, which means that a larger force over a shorter distance yields the same energy as a smaller force over a longer distance. The oscillations we’re talking about here involve very tiny distances obviously. But the principle is the same: we’re talking some moving charge q, and the power – which is the time rate of change of the energy – that goes in or out at any point of time is equal to dW/dt = F·v, with W the work that’s being done by the charge as it emits radiation. The frequency f is the number of cycles per time unit, so that’s expressed per second, i.e. in herz (Hz) = 1/second = s−1. So… Well… It all makes sense: [x joule] = [6.626×10−34 joule]·[1 second]×[f cycles]/[1 second]. But let’s try to deepen our understanding even more: what’s the Planck-Einstein relation really about? So that means that the energy per cycle is equal to 6.626×10−34 joule, i.e. the value of Planck’s constant. Let me rephrase truly amazing result, so you appreciate it—perhaps: regardless of the frequency of the light (or our electromagnetic wave, in general) involved, the energy per cycle, i.e. 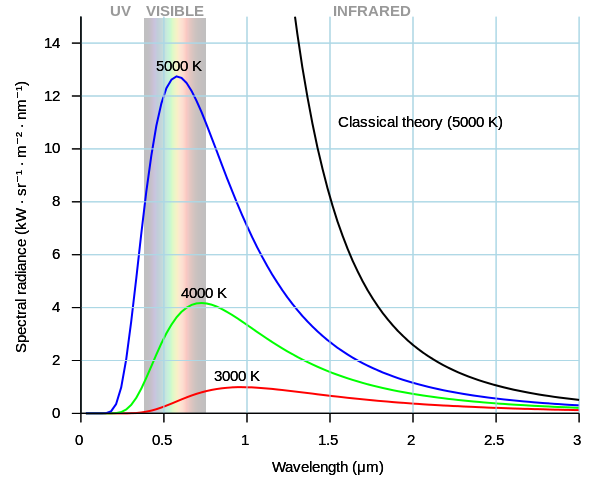 per wavelength or per period, is always equal to 6.626×10−34 joule or, using the electronvolt as the unit, 4.135667662×10−15 eV. So, in case you wondered, that is the true meaning of Planck’s constant! Now, if we have the frequency f, we also have the wavelength λ, because the velocity of the wave is the frequency times the wavelength: c = λ·f and, therefore, λ = c/f. So if we increase the frequency, the wavelength becomes smaller and smaller, and so we’re packing the same amount of energy – admittedly, 4.135667662×10−15 eV is a very tiny amount of energy – into a space that becomes smaller and smaller. Well… What’s tiny, and what’s small? All is relative, of course. 🙂 So that’s where the Planck scale comes in. If we pack that amount of energy into some tiny little space of the Planck dimension, i.e. a ‘length’ of 1.6162×10−35 m, then it becomes a tiny black hole, and it’s hard to think about how that would work. […] Let me make a small digression here. I said it’s hard to think about black holes but, of course, it’s not because it’s ‘hard’ that we shouldn’t try it. So let me just mention a few basic facts. For starters, black holes do emit radiation! So they swallow stuff, but they also spit stuff out. More in particular, there is the so-called Hawking radiation, as Roger Penrose and Stephen Hawking discovered. The interesting thing about blackbody radiation, including Hawking radiation, is that it reduces energy and, hence, the equivalent mass of our blackbody. So Hawking radiation reduces the mass and energy of black holes and is therefore also known as black hole evaporation. So black holes that lose more mass than they gain through other means are expected to shrink and ultimately vanish. Therefore, there’s all kind of theories that say why micro black holes, like that Planck scale black hole we’re thinking of right now, should be much larger net emitters of radiation than large black holes and, hence, whey they should shrink and dissipate faster. The key lesson here is that space and time are intimately related because of the idea of movement, i.e. the idea of something having some velocity, and that it’s not so easy to separate the dimensions of time and distance in any hard and fast way. As energy scales become larger and, therefore, our natural time and distance units become smaller and smaller, it’s the energy concept that comes to the fore. It sort of ‘swallows’ all other dimensions, and it does lead to limiting situations which are hard to imagine. Of course, that just underscores the underlying unity of Nature, and the mysteries involved. My third and final point is about what our professor writes on the fundamental physical constants, and more in particular on what he writes on the fine-structure constant. In fact, I could just refer you to my own post on it, but that’s probably a bit too easy for me and a bit difficult for you 🙂 so let me summarize that post and tell you what you need to know about it. (1) α is the square of the electron charge expressed in Planck units: α = eP2. (2) α is the square root of the ratio of (a) the classical electron radius and (b) the Bohr radius: α = √(re /r). You’ll see this more often written as re = α2r. Also note that this is an equation that does not depend on the units, in contrast to equation 1 (above), and 4 and 5 (below), which require you to switch to Planck units. It’s the square of a ratio and, hence, the units don’t matter. They fall away. (5) The electron mass (in Planck units) is equal me = α/re = α/α2r = 1/αr. So that gives us an expression, using α once again, for the electron mass as a function of the Bohr radius r expressed in Planck units. (6) The electron mass (in Planck units) is equal to me = α/re = eP2/re. Using the Bohr radius, we get me = 1/αr = 1/eP2r. So… Why is what it is? Well… We all marvel at this, but what can we say about it, really? I struggle how to interpret this, just as much – or probably much more 🙂 – as the professor who wrote the article I don’t like (because it’s so imprecise, and that’s what made me write all what I am writing here). Addendum: How to think about space and time? If you read the argument on the Planck scale and constant carefully, then you’ll note that it does not depend on the idea of an indivisible photon. However, it does depend on that Planck-Einstein relation being valid always and everywhere. Now, the Planck-Einstein relation is, in its essence, a fairly basic result from classical electromagnetic theory: it incorporates quantum theory – remember: it’s the equation that allowed Planck to solve the black-body radiation problem, and so it’s why they call Planck the (reluctant) ‘Father of Quantum Theory’ – but it’s not quantum theory. So the obvious question is: can we make this reflection somewhat more general, so we can think of the electromagnetic force as an example only. In other words: can we apply the thoughts above to any force and any movement really? We know that the relative strength of the nuclear force is much larger, because it pulls like charges (protons) together, despite the strong electromagnetic force that wants to push them apart! So the mentioned problem of trying to ‘pack’ some oscillation in some tiny little space should be worse with the strong force. And the strong force is there, obviously, at tiny little distances! Even gravity should become important, because if we’ve got a lot of energy packed into some tiny space, its equivalent mass will ensure the gravitational forces also become important. In fact, that’s what the whole argument was all about! There’s also all this talk about the fundamental forces becoming one at the Planck scale. I must, again, admit my knowledge is not advanced enough to explain how that would be possible, but I must assume that, if physicists are making such statements, the argument must be fairly robust. So… Whatever charge or whatever force we are talking about, we’ll be thinking of waves or oscillations—or simply movement, but it’s always a movement in a force field, and so there’s power and energy involved (energy is force times distance, and power is the time rate of change of energy). So, yes, we should expect the same issues in regard to scale. And so that’s what’s captured by h.
As we’re talking the smallest things possible, I should also mention that there are also other inconsistencies in the electromagnetic theory, which should (also) have their parallel for other forces. For example, the idea of a point charge is mathematically inconsistent, as I show in my post on fields and charges. Charge, any charge really, must occupy some space. It cannot all be squeezed into one dimensionless point. So the reasoning behind the Planck time and distance scale is surely valid. Hmm… There’s not all that much one can say about it. However, when looking at the history of physics, there’s one thing that’s really striking. Most of what physicists can think of, in the sense that it made physical sense, turned out to exist. Think of anti-matter, for instance. Paul Dirac thought it might exist, that it made sense to exist, and so everyone started looking for it, and Carl Anderson found in a few years later (in 1932). In fact, it had been observed before, but people just didn’t pay attention, so they didn’t want to see it, in a way. […] OK. I am exaggerating a bit, but you know what I mean. The 1930s are full of examples like that. There was a burst of scientific creativity, as the formalism of quantum physics was being developed, and the experimental confirmations of the theory just followed suit. We know how electromagnetic waves travel through space: they do so because of the mechanism described in Maxwell’s equation: a changing magnetic field causes a changing electric field, and a changing magnetic field causes a (changing) electric field, as illustrated below. In my post on the Lorentz gauge, I included a few links to Feynman’s Lectures that explain the nitty-gritty of this mechanism from various angles. However, they’re pretty horrendous to read, and so I just want to summarize them a bit—if only for myself, so as to remind myself what’s important and not. In this post, I’ll focus on the speed of light: why do electromagnetic waves – light – travel at the speed of light? You’ll immediately say: that’s a nonsensical question. It’s light, so it travels at the speed of light. Sure, smart-arse! Let me be more precise: how can we relate the speed of light to Maxwell’s equations? That is the question here. Let’s go for it. 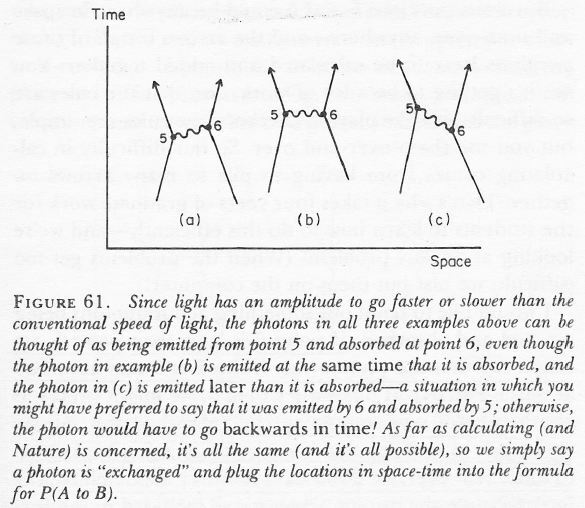 Feynman deals with the matter of the speed of an electromagnetic wave, and the speed of light, in a rather complicated exposé on the fields from some infinite sheet of charge that is suddenly set into motion, parallel to itself, as shown below. The situation looks – and actually is – very simple, but the math is rather messy because of the rather exotic assumptions: infinite sheets and infinite acceleration are not easy to deal with. 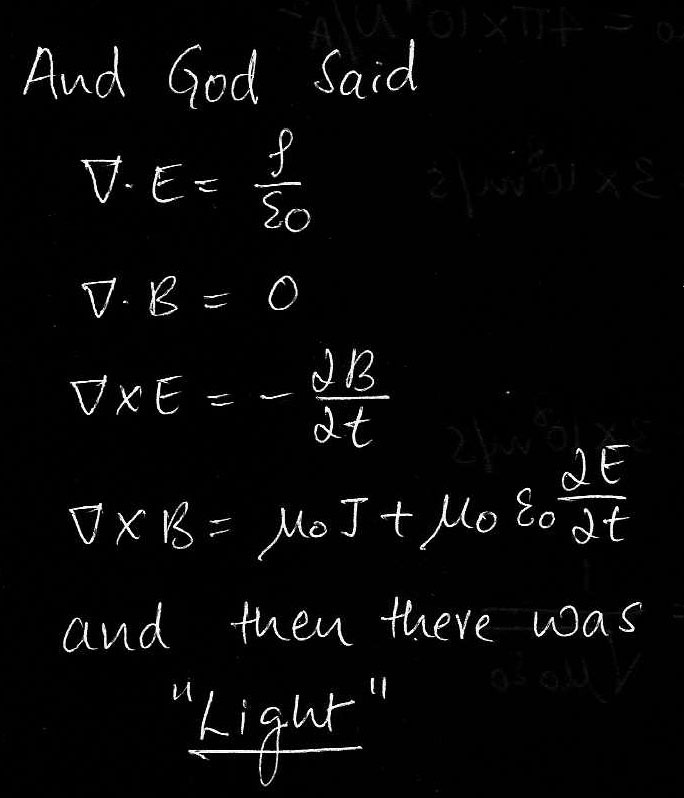 🙂 But so the whole point of the exposé is just to prove that the speed of propagation (v) of the electric and magnetic fields is equal to the speed of light (c), and it does a marvelous job at that. So let’s focus on that here only. So what I am saying is that I am going to leave out most of the nitty-gritty and just try to get to that v = c result as fast as I possibly can. So, fasten your seat belt, please. 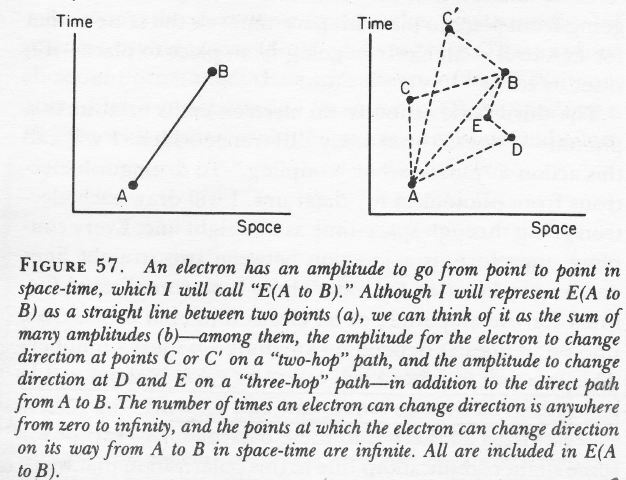 Most of the nitty-gritty in Feynman’s exposé is about how to determine the direction and magnitude of the electric and magnetic fields, i.e. E and B. Now, when the nitty-gritty business is finished, the grand conclusion is that both E and B travel out in both the positive as well as the negative x-direction at some speed v and sort of ‘fill’ the entire space as they do. Now, the region they are filling extends infinitely far in both the y- and z-direction but, because they travel along the x-axis, there are no fields (yet) in the region beyond x = ± v·t (t = 0 is the moment when the sheet started moving, and it moves in the positive y-direction). As you can see, the sheet of charge fills the yz-plane, and the assumption is that its speed goes from zero to u instantaneously, or very very quickly at least. So the E and B fields move out like a tidal wave, as illustrated below, and thereby ‘fill’ the space indeed, as they move out. The magnitude of E and B is constant, but it’s not the same constant, and part of the exercise here is to determine the relationship between the two constants. As for their direction, you can see it in the first illustration: B points in the negative z-direction for x > 0 and in the positive z-direction for x < 0, while E‘s direction is opposite to u‘s direction everywhere, so E points in the negative y-direction. As said, you should just take my word for it, because the nitty-gritty on this – which we do not want to deal with here – is all in Feynman and so I don’t want to copy that. We start with rectangle Γ2. So one side is in the region where there are fields, and one side is in the region where the fields haven’t reached yet. There is some magnetic flux through this loop, and it is changing, so there is an emf around it, i.e. some circulation of E. The flux changes because the area in which B exists increases at speed v. Now, the time rate of change of the flux is, obviously, the width of the rectangle L times the rate of change of the area, so that’s (B·L·v·Δt)/Δt = B·L·v, with Δt some differential time interval co-defining how slow or how fast the field changes. Now, according to Faraday’s Law (see my previous post), this will be equal to minus the line integral of E around Γ2, which is E·L. So E·L = B·L·v and, hence, we find: E = v·B. Now the line integral is just B·L, and the right-hand side is E·L·v, so, not forgetting that c2 in front—i.e. 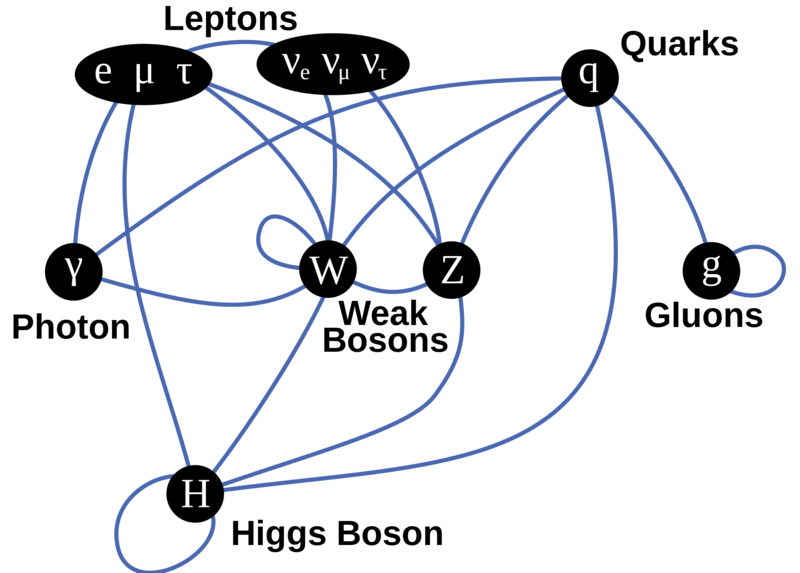 the square of the speed of light, as you know!—we get: c2B = E·v, or E = (c2/v)·B. Now, the E = v·B and E = (c2/v)·B equations must both apply (we’re talking one wave and one and the same phenomenon) and, obviously, that’s only possible if v = c2/v, i.e. if v = c. So the wavefront must travel at the speed of light! Waw ! That’s fast. 🙂 Yes. […] Jokes aside, that’s the result we wanted here: we just proved that the speed of travel of an electromagnetic wave must be equal to the speed of light. As an added bonus, we also showed the mechanism of travel. It’s obvious from the equations we used to prove the result: it works through the derivatives of the fields with respect to time, i.e. ∂E/∂t and ∂B/∂t. Done! Great! Enjoy the view! OK. And then Faraday came up with the exact laws for magnetism, and they involved current and some other constant of proportionality, and Maxwell formalized that by writing ∇×B = μ0j, with μ0 the magnetic constant. It’s not a flux law but a circulation law: currents cause circulation of B. We get the flux rule from it by integrating it. But currents are moving charges, and so Maxwell knew magnetism was related to the same thing: electric charge. So Maxwell knew the two constants had to be related. In fact, when putting the full set of equations together – there are four, as you know – Maxwell figured out that μ0 times ε0 would have to be equal to the reciprocal of c2, with c the speed of propagation of the wave. So Maxwell knew that, whatever the unit of charge, we’d get two constants of proportionality, and electric and a magnetic constant, and that μ0·ε0 would be equal to 1/c2. However, while he knew that, at the time, light and electromagnetism were considered to be separate phenomena, and so Maxwell did not say that c was the speed of light: the only thing his equations told him was that c is the speed of propagation of that ‘electromagnetic’ wave that came out of his equations. The rest is history. In 1856, the great Wilhelm Eduard Weber – you’ve seen his name before, didn’t you? – did a whole bunch of experiments which measured the electric constant rather precisely, and Maxwell jumped on it and calculated all the rest, i.e. μ0, and so then he took the reciprocal of the square root of μ0·ε0 and – Bang! – he had c, the speed of propagation of the electromagnetic wave he was thinking of. 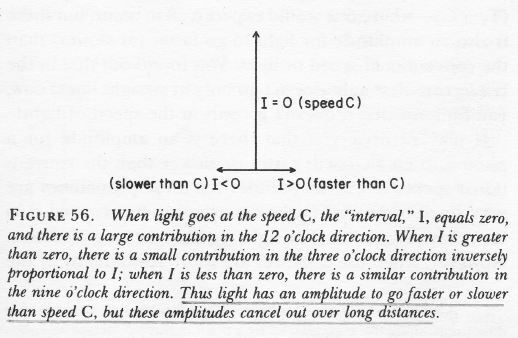 Now, c was some value of the order of 3×108 m/s, and so that happened to be the same as the speed of light, which suggested that Maxwell’s c and the speed of light were actually one and the same thing! I’m sorry I can’t do that for you. I don’t know how. I have no picture of this electromagnetic field that is in any sense accurate. I have known about the electromagnetic field a long time—I was in the same position 25 years ago that you are now, and I have had 25 years more of experience thinking about these wiggling waves. When I start describing the magnetic field moving through space, I speak of the E and B fields and wave my arms and you may imagine that I can see them. I’ll tell you what I see. I see some kind of vague shadowy, wiggling lines—here and there is an E and a B written on them somehow, and perhaps some of the lines have arrows on them—an arrow here or there which disappears when I look too closely at it. When I talk about the fields swishing through space, I have a terrible confusion between the symbols I use to describe the objects and the objects themselves. I cannot really make a picture that is even nearly like the true waves. So if you have some difficulty in making such a picture, you should not be worried that your difficulty is unusual. Our science makes terrific demands on the imagination. The degree of imagination that is required is much more extreme than that required for some of the ancient ideas. The modern ideas are much harder to imagine. We use a lot of tools, though. We use mathematical equations and rules, and make a lot of pictures. What I realize now is that when I talk about the electromagnetic field in space, I see some kind of a superposition of all of the diagrams which I’ve ever seen drawn about them. I don’t see little bundles of field lines running about because it worries me that if I ran at a different speed the bundles would disappear, I don’t even always see the electric and magnetic fields because sometimes I think I should have made a picture with the vector potential and the scalar potential, for those were perhaps the more physically significant things that were wiggling. Perhaps the only hope, you say, is to take a mathematical view. Now what is a mathematical view? From a mathematical view, there is an electric field vector and a magnetic field vector at every point in space; that is, there are six numbers associated with every point. Can you imagine six numbers associated with each point in space? That’s too hard. Can you imagine even one number associated with every point? I cannot! I can imagine such a thing as the temperature at every point in space. That seems to be understandable. There is a hotness and coldness that varies from place to place. But I honestly do not understand the idea of a number at every point. So perhaps we should put the question: Can we represent the electric field by something more like a temperature, say like the displacement of a piece of jello? Suppose that we were to begin by imagining that the world was filled with thin jello and that the fields represented some distortion—say a stretching or twisting—of the jello. Then we could visualize the field. After we “see” what it is like we could abstract the jello away. For many years that’s what people tried to do. Maxwell, Ampère, Faraday, and others tried to understand electromagnetism this way. (Sometimes they called the abstract jello “ether.”) But it turned out that the attempt to imagine the electromagnetic field in that way was really standing in the way of progress. We are unfortunately limited to abstractions, to using instruments to detect the field, to using mathematical symbols to describe the field, etc. But nevertheless, in some sense the fields are real, because after we are all finished fiddling around with mathematical equations—with or without making pictures and drawings or trying to visualize the thing—we can still make the instruments detect the signals from Mariner II and find out about galaxies a billion miles away, and so on.